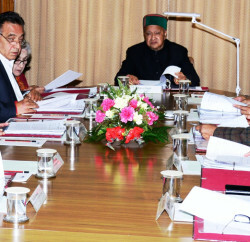 Himachal Pradesh Cabinet in its Meeting held here today decided to revise incentives to Rogi Kalyan Samiti (RKS)/Contract Medical Specialists and Medical Officers (Allpopathy MBBS Doctors). OBG, Surgery, Anaesthesia, Paediatrics, Radiologist Specialists posted in Pangi, Pooh area (Pooh Tehsil and Hangrang Sub-Tehsil in district Kinnaur), Dodra-Kwar Sub-Division in district Shimla will be entitled for Special Incentive of Rs. 25,000 per month; Specialists posted in Kinnaur (except Pooh Tehsil and Hangrang Sub-Tehsil), Bharmour Sub-Division of district Chamba, Development Blocks, Chopal, Chohara (except Dodra-Kwar) in district Shimla, Sangrah, Shillai in district Sirmour, Ani in district Kullu, Tissa in district Chamba, Chhota Bhangal of Multan and Bara Bhangal area in district Kangra, to get Rs. 20,000 as Incentive, besides Rs. 15,000 monthly incentive would be available for posting in Development Blocks, Shillai, in district Sirmour, Jubbal-Kotkhai in district Shimla, Salooni in district Chamba, Rohru, Nankhari in district Shimla and Karsog in district Mandi. Medical Officers (MBBS) posted under RKS/Contract will also be entitled to get Special Incentive of Rs. 15,000 for serving in Pangi Sub-Division, entire Lahaul & Spiti district, Pooh area of district Kinnaur and Dodra Kwar in district Shimla, while in rest of the above stations, a special incentive of Rs. 10,000 would be provided to them. 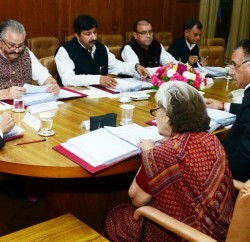 Chief Minister Prem Kumar Dhumal presided over the Meeting. It was decided to open new Tehsil at Tauni Devi, district Hamirpur, upgrade Sub-Tehsil at Multhan (Chhota Bhangal) , district Kangra to full fledged Tehsil and open Sub Tehsils at Tihra in Sarkaghat Sub-Division of district Mandi, Nagrota Surian, Dehra Sub-Division of district Kangra and Darlaghat in Arki Sub-Division of district Solan, to cater to the revenue services to the local population and keeping in view work load, geographical constraints and long pending demand of the local people. Cabinet also decided to create a separate new Development Block for Sri Naina Devi jee Assembly Constituency at Swarghat in district Bilaspur and create 9 posts of different categories to make the same functional and also sanctioned one vehicle for Block Development Office. It was approved to provide 8 kgs. of food grains/wheat flour to each of the family member of ration card holders in remote and difficult areas of Dodra Kwar in district Shimla and Bara Bhangal in district Kangra through retail outlets under Public Distribution System, by relaxing the norms of 35 kgs. of food grains per family applicable to BPL/APL and Antyodaya Families. It was decided to provide one eco-friendly quality carry bag to each of the ration card holder once in a year to carry home food grains and other commodities, through retail outlets under PDS. Cabinet also decided to create and fill up 84 posts of different categories to make the offices of Himachal Pradesh Building and Other Construction Workers Welfare Board functional at district level and 9 additional posts to strengthen the Board Headquarter; 13 posts of different teaching and non-teaching categories to make Government Degree College, Kotla Behar in tehsil Jaswan, district Kangra, functional. It was decided to create 3 supernumerary posts of Superintendent Grade-I in Public Works Department. It was approved to select 15 candidates under Himachal Pradesh Subordinate Accounts Services (General Branch) Part I and II, by conducting a competitive entrance examination through Himachal Pradesh Public Service Commission to undergo training in Himachal Pradesh Institute of Public Administration. It was decided to provide mobile diagnostic facilities to the residents of Beetan village in district Una. It was decided to approve Pre-Mature Release under Mercy Petition Cases in favour of 4 convicts undergoing imprisonment in different prisons in the State. It was decided to issue ‘No Objection Certificate’ in favour of Gautam Girls College of Management Committee, Hamirpur and Vidyavati Memorial Education Society, Nurpur, district Kangra, to start GNM/B.Sc. Nursing courses. It was decided to allow setting up of a bottling plant by M/s Paradise Distilleries Private Limited at village Nehra, tehsil Pachhad, district Sirmour for bottling of English and Country liquor. It was approved to amend Form L.T.XII appended to the Himachal Pradesh Tax on Luxuries (in Hotels and Lodging Houses) Rules, 1979. 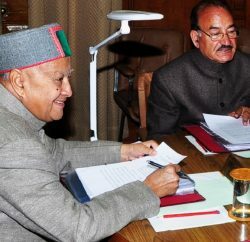 It was also approved to amend Section 10 of Himachal Pradesh Land Revenue Act, 1954 related to demarcation. It was decided to approve Building Plan for Irrigation and Public Health Department Headquarter at Tutikandi, Shimla. Approval was granted for purchase of Toyoto Corola Altis Cars to all eleven Hon’ble Judges of Himachal Pradesh High Court; one Maruti Dzire Car for Environment, Science and Technology Department.